This event is not presented by AAASWFL, however AAASWFL is a sponsor/member of the Charlotte Positive Aging Committee and will have an information table at the event. 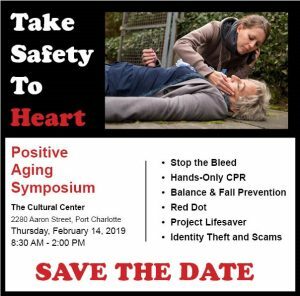 At the Charlotte Positive Aging Symposium, learn how to ‘Take Safety to Heart.’ Discover how to perform hands-only CPR, take care of a bleeding situation until help arrives, prevent falls in your home, protect yourself from identity theft and scams, and more. Lunch is provided. Cost to attend is $5. To register, call the Charlotte Cultural Center at 941-625-4175.